Is Ottawa the Coldest Capital City? Snow-covered castle in Helsinki, Finland. The coldest capital city in the world is not in Canada or in Northern Europe but in Mongolia; it's Ulaanbaatar, with an average annual chilly temperature of 29.7°F and -1.3°C. Southern capital cities just don't reach far enough south to get very cold. For instance, if you think about the southernmost capital in the world -- Wellington, New Zealand - images of ice and snow are probably far from your mind. Thus, the answer had to lie in the higher latitudes of the Northern Hemisphere. Searching WorldClimate.com for the annual mean of the daily (24-hour) temperature for each capital city in that area, one can find which cities are, in general, the coldest. Interestingly, Ottawa, considered an extremely cold city in North America, had an average of "only" 41.9°F/5.5°C—meaning it wasn't even in the top five! It's number seven. Also interesting is that the northernmost capital city in the world—Reykjavik, Iceland—is not number one; it falls in the list at number five. Good data for the capital of Kazakhstan, Astana, just doesn't exist, but it would appear from nearby climate data and other sources of information that Astana falls between number one (Ulaanbaatar) and number three (Moscow). Here's the list, starting with the coldest. Ulaanbaatar is the largest city of Mongolia as well as its capital and is a destination for both business and pleasure trips. It is below zero for five months of the year. January and February are the coldest months with the temperature ranging between -15°C and -40°C. The average annual temperature is -1.3°C. Astana is one of the strangest cities that exists, with tall futuristic-looking buildings made of shiny metal and glass rising abruptly out of the flat steppe landscape on the banks of Ishim River. It is the second largest city in Kazakhstan. Astana means "the capital city" in Kazakh. It was designated the capital city in 1997 and the previous name was changed to Astana in 1998. The climate is extreme. Summers can be very warm, with temperatures occasionally reaching +35°C (95°F) while winter temperatures can fall to -35°C (-22 to-31°F) between mid-December and early March. Moscow is the capital of Russia and the largest city on the European continent. It is situated on the Moskva River. It has the largest forest area within its borders of any other major city and is well-known for its many parks and distinctive architecture. The winters in Moscow are long and cold, lasting from the middle of November until the end of March, with winter temperatures varying widely from -25°C (-13°F) in the city, and even colder in the suburbs, to above 5°C (41°F). In the summer the temperature ranges from 10 to 35°C (50 to 95°F). 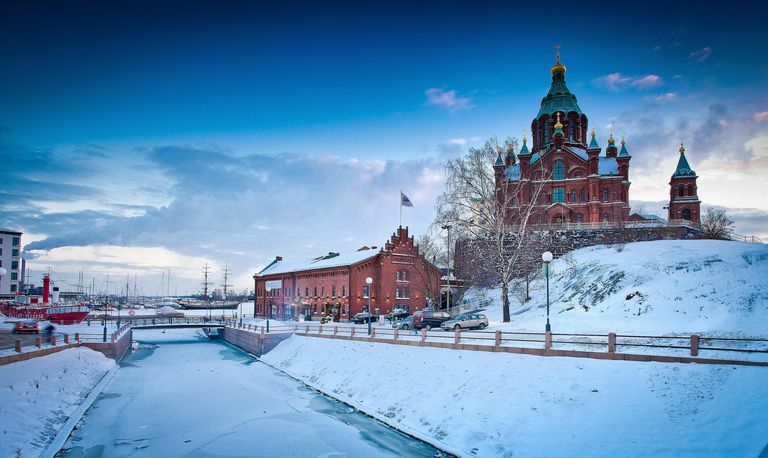 Helsinki is both the capital and largest city of Finland, situated on the shore of the Gulf of Finland on the tip of a peninsula and on 315 islands. The average winter temperature in January and February is -5°C (23°F). Given Helsinki's northern latitude one would normally expect colder winter temperatures, but the Baltic Sea and North Atlantic Current have a mitigating effect on the temperatures, keeping them somewhat warmer in the winter, and cooler during the day in the summer. Reykjavik is Iceland's capital and largest city. It is located in southwestern Iceland on the shore of Faxa Bay and is the world's northernmost capital of a sovereign state. Like Helsinki, temperatures in Reykjavik are affected by the North Atlantic Current, an extension of the Gulf Stream. The temperatures are warmer in the winter than would be expected by the latitude, rarely falling below -15°C (5°F), and the summers are cooler, with temperatures generally ranging between 10 and 15°C (50 and 59°F). Tallinn is the capital and largest city of Estonia. It is located at the northernmost part of Estonia on the shore of the Gulf of Finland. It was first established in medieval times but is now a mix of ancient and modern. It has the distinction of being dubbed the "Silicon Valley of Europe" and has the highest number of startups per person in Europe. Skype, for example, got its start there. Due to its location on the coast and mitigating effect of the sea, the winters are cold but warmer than one would expect for the latitude. February is the coldest month, with the average temperature being -4.3°C (24.3°F). Throughout the winter, temperatures are close to freezing. Summers are comfortable with temperatures during the day between 19 and 21°C (66 to 70°F). In addition to being its capital, Ottawa is the fourth largest city in Canada, most educated, and has the highest standard of living in Canada. It is in southern Ontario on the Ottawa River. Winters are snowy and cold, with an average January minimum temperature of -14.4°C (6.1°F), while summers are warm and humid, with an average July maximum temperature of 26.6°C (80°F).